INCOR® is an implantable ventricular assist device. As an LVAD (left ventricular assist device), it is intended for support of the left ventricle. 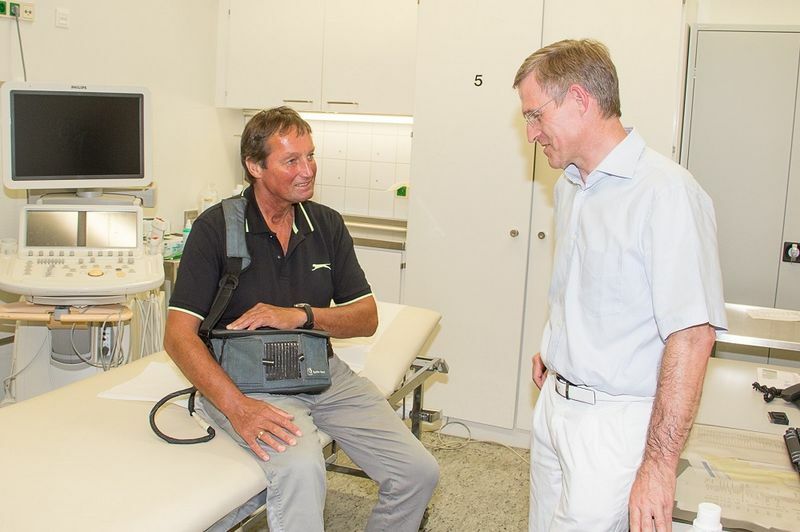 Berlin Heart developed the INCOR® system because an increasing number of patients is dependent on permanent circulatory support ("destination therapy", DT). The axial rotor in the INCOR® pump is suspended in air and actively supported magnetically. The system is thus able to take over the total pump output of the left ventricle permanently and in a wear-resistant manner. Aside from being a permanent form of therapy, INCOR® can also be used to bridge the time until transplantation ("bridge to transplant", BTT) or until recovery of the heart ("bridge to recovery", BTR). Since its first use in 2002, the system has supported approximately 700 patients. 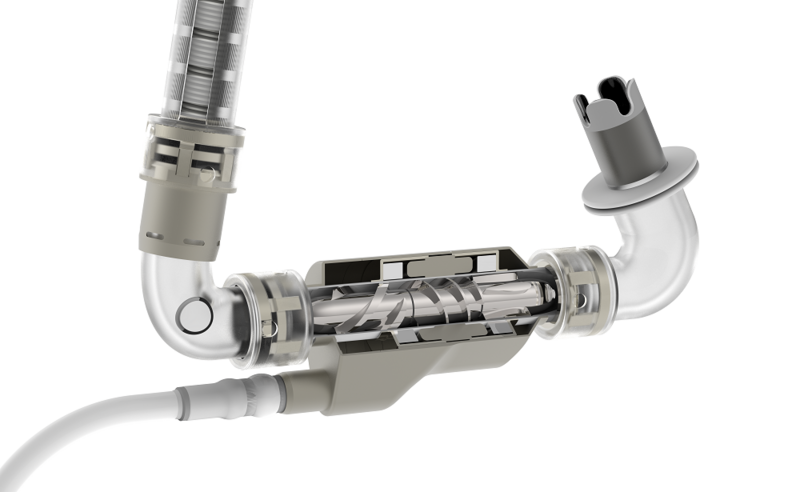 The INCOR® pump is implanted directly under the heart and above the diaphragm. Cannulae connect the pump with the heart and the aorta (main artery). The pump also includes a cable that connects the pump to a control unit outside of the body. The control unit and two external batteries power the motor in the INCOR® pump. In this manner, the system allows for a continuous flow and pumps up to eight liters of blood per minute throughout the body. Because the blood does not flow in a pulsating, but rather in a constant manner, patients have only a weak pulse or no pulse in most cases. With the two batteries, the patient is mobile for up to seven hours. Implantation is performed using standardized surgical techniques and a cardiopulmonary bypass machine. The two cannulae are usually connected to the left side of the heart and to the aorta while the heart continues to beat. In exceptional cases, the heart is briefly stopped. The INCOR® pump is then connected with the cannulae. Next, the surgeon tunnels the driveline through the skin. The driveline emerges from the skin on the right abdomen. Clinic personnel connect the driveline with the control unit, which is operated by two batteries. 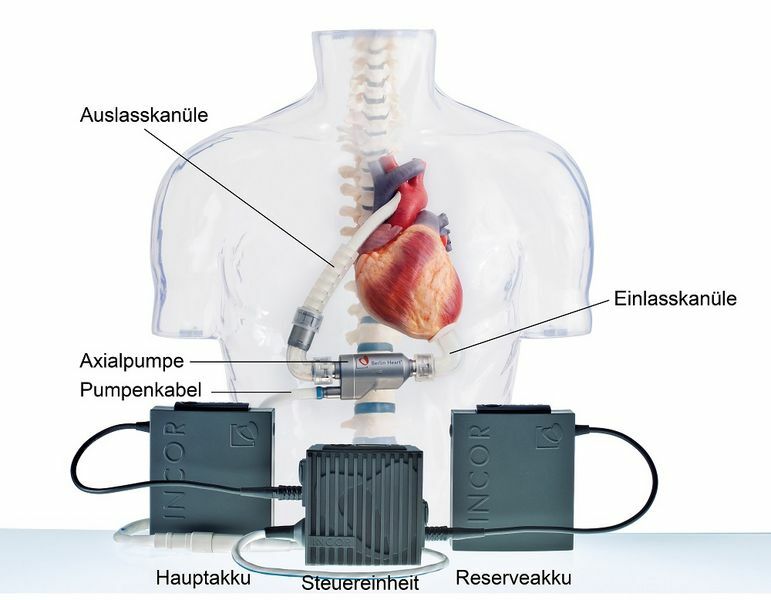 As soon as the INCOR® pump is switched on, it pumps blood from the weakened left ventricle, via the aorta, into the body. Finally, the work of the CPB machine is reduced and ultimately ended. Following surgery, the patient receives care in the intensive care unit. Experienced ICU physicians and nurses now monitor the patient's healing process. If progression is normal, the patient remains approximately ten days in the hospital. It is now very important to check, clean and dress the transcutaneous exit site of the driveline at regular intervals, in order to support a rapid healing process. The function of the ventricular assist device is continuously monitored. The patient takes anticoagulants (drugs that inhibit blood clotting) from this point on, in order to prevent the formation of blood clots (deposits). Next, options for regular movement are considered. After prolonged periods of bed rest, muscular atrophy occurs and the lost muscle mass must be gradually recovered. The treating physician can recommend suitable options for accelerating the recovery process, e.g. through walking, riding a bike, or gymnastic exercises. An important topic is that of wound care and long-term medication-based anticoagulation. The dressing at the transcutaneous exit site must be changed regularly and with great care, and the wound must be treated. Following successful training on wound care, on operating the VAD, and on managing vital medications (e.g. anticoagulants for thinning of the blood), a patient in appropriate health condition can be discharged to home. For example, the patient must be able to control the operating time of the main battery and exchange the batteries. The patient also learns how to react to ventricular assist device messages. From this point on, the patient is only required to visit the outpatient treatment center at the hospital for routine checkups. If required, the hospital VAD team is also available at all times. The postoperative care and wound care do not have to be conducted at the implantation hospital. These can also be conducted at a hospital that is local to the patient. The INCOR® system allows for a mobile lifestyle. This not only increases the patient's enjoyment of life but also enables him/her to prepare more effectively for a possible heart transplantation. 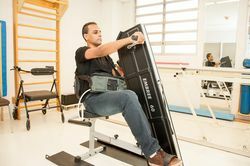 Mobile also means that the patient is better able to perform everyday tasks and to pursue leisure activities. 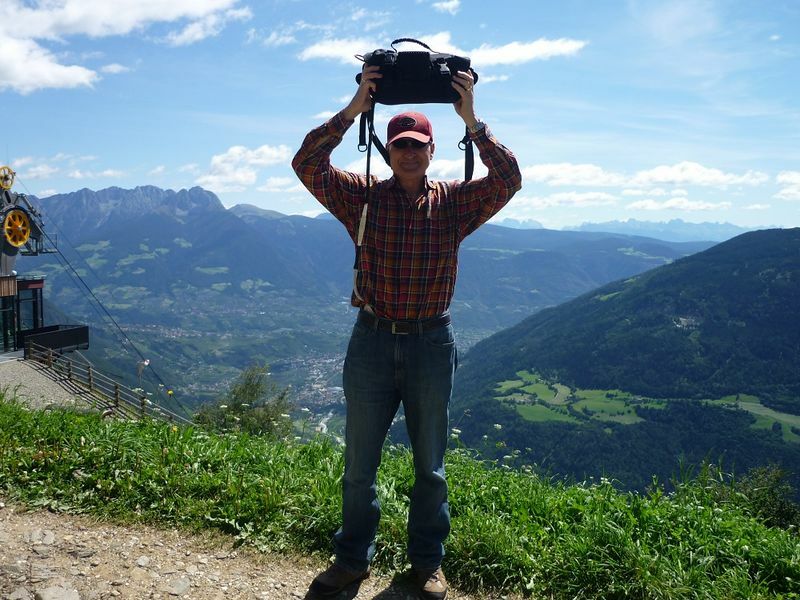 Many patients go shopping, ride a bike, and go on vacation with their INCOR® system. If the physician and employer are in agreement, even going back to work is a possibility. Note: The therapy descriptions presented here are only illustrative and may vary from patient to patient. If you have questions regarding your individual condition and therapy options, please talk to your treating physician. After the INCOR system had supported his heart for more than seven years, a donor heart finally became available. 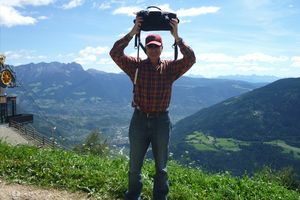 "I can basically lead a normal life again and have no significant loss in my quality of life."